View of Loch Lubnaig, near Callendar, in Scotland by Thomas Walmsley. The loch is situated in an area known as the Trossachs and is known for its wild and dramatic scenery. Loch Lubnaig is approximately four miles in length, three miles in width and it drops to a depth of more than forty meters. It lies on the headwaters of the River Teith and is fed by the River Blavag. 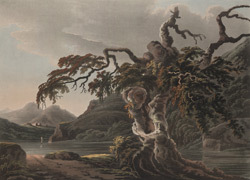 Walmsley (1763- 1806) was an accomplished landscape artist who began his career as a scene painter at the Opera House in London. He is known for his dramatic use of colour and theatrical arrangement of his scenes.